Megaphone Magazine’s annual Big Sell event is coming up on Thursday, February 9th. At the Big Sell, local celebrities, business leaders and politicians act as guest vendors for an hour and stand alongside Megaphone’s homeless and low-income vendors and try their hand at selling Megaphone. Street papers like Megaphone do this event around the world to celebrate the hard work of 10,000 vendors. I participated in the event last year, alongside Janet, who was a total pro! 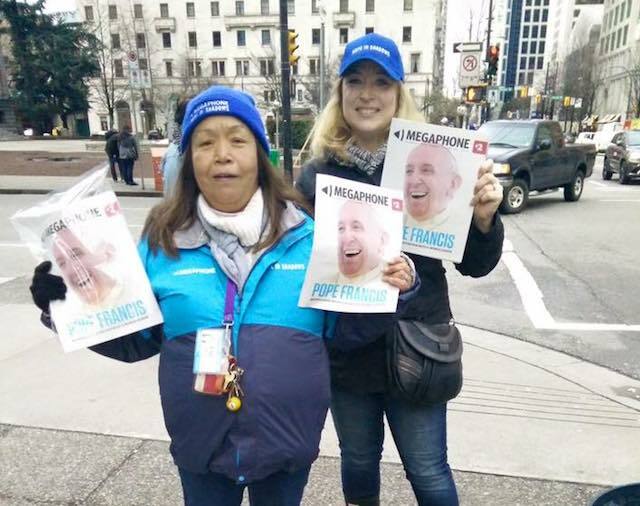 It was the first time Vancouver’s Megaphone participated in the event and it was a huge success. Vendors and guest vendors sold more than 250 copies of Megaphone in just under an hour. Look for vendors, and celebrity guest vendors, this Thursday from 10:30am to 11:30am around the Vancouver Art Gallery in Downtown Vancouver and purchase your copy of Megaphone. In this month’s issue, Downtown Eastside actor, artist, motivational speaker, and youth counsellor Duane E Howard talks about his road to Hollywood and the lack of indigenous representation in film. Find a vendor in Vancouver or Victoria to buy your magazine. Just $2 supports meaningful work for people experiencing poverty in your community, and gets you a great read in return. Download the Megaphone App for iPhone and Android to find & pay vendors, even when you don’t have cash. Buy a Megaphone at the Big Sell on Thursday to support people experiencing poverty and homelessness in our city. Megaphone’s 160+ vendors in Vancouver and Victoria work hard every day to create positive change in their own lives, and in the communities we share. Follow the conversation online @MegaphoneMag.